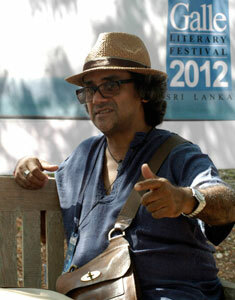 Sure, the Galle Literary Festival (GLF) is about books. Not Really. For a lot of people, especially those who’ve been attending the festival over a number of years, GLF is about discovery. Discovery not only of new authors and new books and new things about old authors and old books, but also ideas, people, perspectives. What GLF does is create the kind of atmosphere conducive to discussion, and if you’ve ever been to GLF you will know that Galle Fort has a huge role to play in that. You will know it best, if you’ve been on an ‘Excursion’ through the quaint old place with Channa Daswatte. In what comes across as a characteristically carefree vein he jokes that by 2010 “they (GLF) decided they’d had enough of me walking”. So that year’s GLF excursion was, in fact, not a literal one but a figurative one which took the form of an audio-visual presentation ‘A Room of Their Own’ (ringing quite aptly of Forster!) by Channa Daswatte – a look, he says, at architects’ houses. And though 2011 saw an enthusiastic return of the walk around the Galle Fort, by the time GLF plans for 2012 were being discussed, Channa confides, the thought of another walk was “really, really boring, for me”. So together with Jetwing, GLF organized what the architect (The Architect!) calls “a sort-of part-tour of the suburbs of Galle”, looking at the variety of influences on architecture “a stone’s throw” from the Fort. The sites Channa chose for this year’s tour, he says, embody “how people began to decorate their buildings taking fashion cues from other religions, other cultures” and in these borrowings “created a very beautiful architecture”. This sort of mixing and borrowing, he says (albeit hesitantly), is still common, although it happens with “a lot of bad taste”. What he sees as a problem in contemporary Sri Lankan architecture is that “there is no specific style that seems to be prevalent”. Seemingly regretful, he continues that “that's what comes of a democracy, when everyone has their opinion. I know it’s a terrible thing to say, but, most great architecture arises out of power and dictatorship”. Timeless wonders such as St. Peter’s Tomb and the Sistine Chapel, he points out, arose out of the Pope’s supremacy. One reason for the popularity of the GLF Excursions is becoming clear. Channa Daswatte has tonnes of ideas to share, and be these on governance, identity, ambition or history, their figurative foundations lie in literal buildings. Plus he is articulate and witty, in a quiet sort of way. He seems to enjoy himself on the tours. “It has truly been good fun for the last six years, and I don't know whether they'll ask me next year, they may not!” he laughs. But the fact that the excursion tickets sell out “minutes” after they’re issued should clear all doubt. Not only is the tour entertaining, it is also informative in a way that tourist guide-books and Wikipedia simply are not. One of the sites on this year’s excursion (and probably one of the most desired boutique hotels in the world! ), The Dutch House, dates all the way back to 1730. What Channa is interested in bringing to our notice though, is how as far back as the 18th century, the “classic” Palladian plan (stylistic bent named after Venetian architect Andrea Palladio who drew inspiration from classical temples) is fused with patterns from the typical “Sri Lankan Sinhalese houses” to create something unique. A little later, around 1820, is built a similar house that was recently complemented by what Channa calls “tropical modernist style” additions to the garden by architect Kerry Hill, resulting in “[an] old house surrounded by these very beautiful, contemporary constructions”. The highlight for him though, is “a beautiful old temple”. It is “on the inside, a Sinhalese temple with the Buddha and all the paintings and so on of the southern school”, Channa describes, “but on the outside it's entirely decorated with the baroque, which you find in the Dutch-reformed church!” Another example of such unexpected similarity, he shares excitedly, is St. Mary’s Cathedral and the mosque just opposite the road from it, both with towers on either side, framing a similar main structure. But while the architect is seeing form, the inner child has begun to hear the tale of “how these things begin to work”. Channa Daswatte is no architect or designer. He is a storyteller. “I can see myself retiring in some lovely old house somewhere, and telling stories to people” he smiles and, on second thought, laughs. “Every time I take people on this walk I try to tell a slightly different story”. So the theme of each tour is different, and “even if someone comes for all the tours, they're not doing the same tour”. Even when he is working on a new design, Channa is making stories. Of his latest project he says “it’s in Beruwela so it's got something to do with the Muslim culture that's there”. The story then, is about “how that gets integrated into the building – and suddenly there's a huge oculus in the middle of the building - oh, that's where the dome was, which collapsed into a garden and -” one can’t help but be caught up in the images he deftly conjures up in one mad flow. It is somewhat amusing but at the same time incredibly inspiring. “I try to live that story” he explains, adding that whether visitors to the building see his story for the place or not, “there's still something interesting that comes out of [it] - at least [for] myself”. But, “if that translates and is readable, to someone who comes in the building, then that's fantastic”. Ultimately, he says, his work is “very openly eclectic”. He picks “different strands and threads” from different “cultures of understanding architecture” and puts them together, “enjoying how they relate and interact with each other.” He believes that the fact of there being “no identifiable style” to his work is a result of his philosophy on life as a celebration of diversity. “I think we might not have so many problems if we accept each other for absolutely who we are” he says, simply. The Galle Fort too, he believes, we ought to see in the same way “absolutely for what it is...this wonderful mix of architecture[s] and culture[s]”. True Channa has special memories of Galle from his childhood holidays to his times as a student of, and understudy to Geoffrey Bawa, but what really draws him to the place is this fusion, what he likes to call the “mongrelism”, of the place. “We always call it the Dutch Fort when it’s really not the Dutch Fort. There’s very little ‘Dutch’ left of it. And to start with, it was built by the Portuguese, so it’s really the Portuguese Fort, of Galle – or wait, is it the British Fort! ?” This confusion, this “wonderful, wonderful” mix of different periods and cultures he believes is what gives the old place “an architecture that is so rich” and its own special magic.